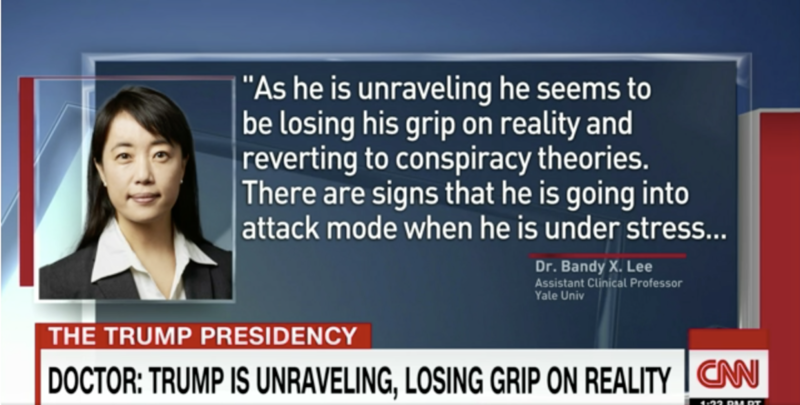 Establishment media outlets including CNN and MSNBC have helped mainstream a conspiracy theory claiming President Donald Trump is mentally ill.
At the center of the conspiracy theory is Yale psychiatry professor Bandy Lee, who for over a year has claimed that Trump is mentally impaired and unfit to serve, pointing at his tweets as evidence. During Trump’s presidential campaign, Lee flouted industry norms against publicly diagnosing a patient without his consent or an in-person examination. She justified doing so on the grounds that she is “obligated to break them in times of emergency.” She continued her campaign after the election, earning a book deal in the process. Lee told New York magazine in April last year that she was a “pariah” at her department because of her campaign about the president’s mental health, which now includes the book “The Dangerous Case of Donald Trump: 27 Psychiatrists and Mental Health Experts Assess a President.” Lee’s book, which came out Oct. 3, argued that psychiatrists have a “duty to warn” the country about President Trump. Following the Politico report, establishment media outlets hyped Lee’s allegations — which she has been making for over a year — as a new development. Reporters brought up the allegations at the White House press briefing on both Wednesday and Thursday. MSNBC and CNN both gave considerable airtime on Thursday to Lee’s allegations about the president, and interviewed Democratic lawmakers about Lee’s claims. Both networks treated Lee’s accusations as credible. Earlier this week, Stelter called Trump’s latest tweets “madness” and asserted as fact that the president is mentally unfit to serve. Stelter’s evidence of Trump’s mental health was not based on medical evidence, but on the president’s tweets. Stelter’s rush to speculation now presents a sharp contrast to the way he covered rumors about Clinton’s health. In 2016, Stelter harshly criticized media outlets who raised questions about Clinton’s health. Unlike with Trump, questions about Clinton’s health weren’t pure speculation: Clinton had a pattern of documented medical episodes, including a concussion and a life-threatening blood clot. When questions arose about Clinton’s health in August 2016 — after a prolonged, public coughing fit silenced Clinton while giving a speech — Stelter deferred to Clinton’s doctors about the state of her health. Stelter blasted Fox News host Sean Hannity for questioning Clinton’s health. Stelter acknowledged Clinton had a “health scare” in 2012, but reassured viewers that “her doctors say she is now physically fit to be president. There is no doubt about that.” Less than a month later, Clinton suffered another medical episode and had to be physically assisted as she fainted into a campaign van. Now, the media have no documented medical episodes to point to, but they do have tweets and speculation. Appearing on Anderson Cooper’s show Tuesday night, Stelter fixated upon the 16 tweets Trump sent that day. “We could apply a test to his 16 tweets today. If this were the leader of Germany or China or Brazil, what would we say? How would we cover these tweets? We would say these are the messages from a person who is not well, from a leader who is not fit for office,” Stelter asserted. As Stelter began wildly speculating about the president, Cooper steered the conversation away from discussing Trump’s mental fitness. “The counterargument is that he has a different style and other presidents have tried more diplomatic language, more presidential language vis-a-vis North Korea, and they say look, that didn’t work and this is the way to go,” Cooper said.